We came up north to escape hurricanes and the heat of Mexico but while that plan worked out for hurricanes, not so much for the heat. Lordy it has been hot and humid here. Of course the big reason we are in San Diego and not Ensenada was to give Austin a place to live while he searched for a rental house and started his new job. That did work as planned and he is all settled in to a nice place. I believe we were his first dinner guests! With a long project list, we decided to just stay in San Diego through October to get it all done. We can walk to West Marine so it really was a no brainer. And as often happens, new things got added to the list that we didn’t plan on. Like a new chart plotter, which of course was not compatible with our radar antenna. Both took 2 days to install each mostly because we had difficulty getting the end connectors into the small areas through which the cables had to pass. Can I just have one hour with the people designing these things so I can explain the real world application, um small cruising boats? Always improvising. The radar dome was high off the stern. 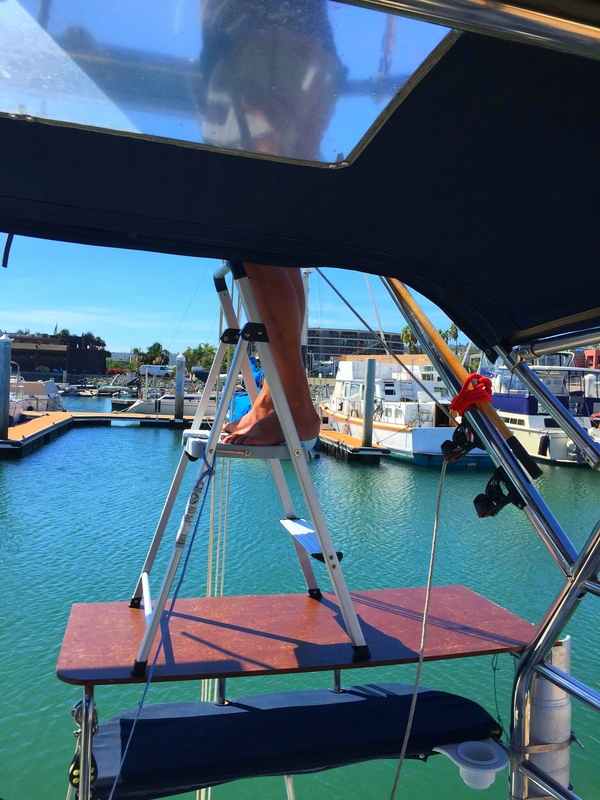 A stool on top of a door panel on top of the stern seat makes a great ladder. Good thing the marina was calm! 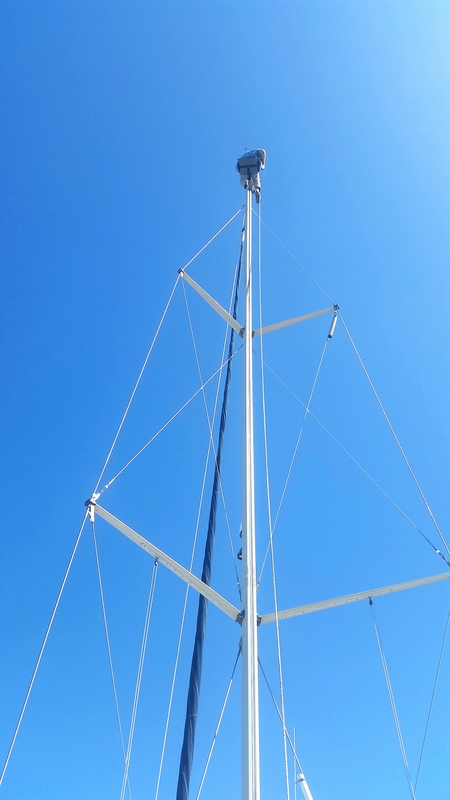 Our rigger installing the new wind vane and cable. After that portion was complete, Gary and I had to run the new cable through the boat and up to the helm. The only problem was we couldn’t determine where the old cable was running. We have run a lot of cable through the boat, but this one was in a totally new area not yet explored. So on to plan B which was to splice the new cable in the mast to the existing cable in the boat which we knew was still working. Raymarine even provided a splicer. One problem solved but we created a new problem by cutting the connector at the helm in preparation for pulling the old wire out. We can’t locate the tiny connectors we need in any of the marine places nearby but we will have the car tomorrow and will hopefully be able to find them. Our neighbor commented that he is surprised we can do these kinds of projects together. Humor baby, humor! The last big job is installing 4 new batteries. Not hard but heavy! It’s not like we can back the car up to the boat. It is a four step process to get them from the car and down the steps into the cabin. But, we do have a 6’2”, 180 lb. son who lifts weights. I might get off easy on this job. Our last hurrah before leaving for Mexico will be celebrating Austin’s 23rd birthday. Then we are off weather permitting where we can again have some balance. A little work and a lot of play time.